Ever since the 'Link Trainer' was developed by Edwin Link, pilot training has used the possibilities of simulated flight to the fullest. These early machines were mechanical and some parts could trace their lineage back to Mr. Link's original job as an organ builder. Through the years as technology matured so did flight simulators and BOAC used two classic analogue VC10 flight simulators which were the cream of the crop in those days. Peter Justin (who is an ex-BOAC Simulator Engineer, 1973-1977) was kind enough to provide a description of these simulators to start off this page. BOAC operated a pair of VC10 Flight Simulators at the Cranebank Training Centre and these were in constant use throughout the BOAC/BA VC10 era. One of the pair of simulators was configured to simulate a Standard VC10 and the other a Super VC10. In addition to routine aircrew licence renewal checks, they were also used for everything from initial cadet training to conversion and command courses. Simulator time was also occasionally utilised by other VC10 operators. 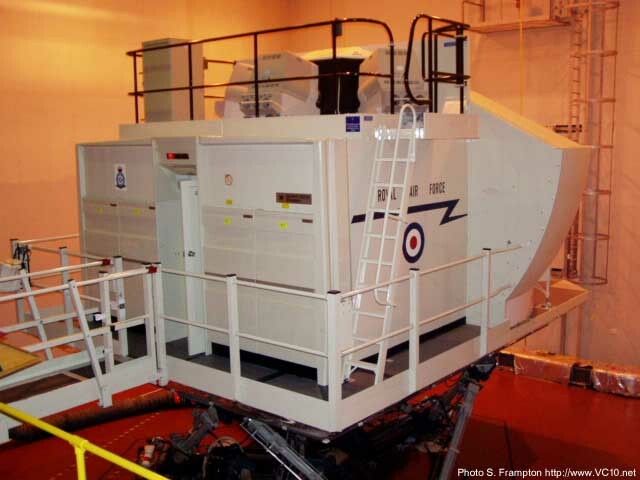 The simulators were manufactured by Redifon and provided a comprehensive training environment with flight, aircraft systems, radio navigation and communication being simulated. A sound system was included to add to the authenticity. An Instructor’s console was provided within each simulator flight deck. The instructor was able to set parameters such as aircraft weight, C of G position and initial fuel quantity. He could also introduce a large range of ‘failures’ in to the various aircraft systems during the flying. These could range from a very obvious event such as an engine fire or failure on take-off, to a more subtle failure such as a ‘sticky’ beam bar or failure flag in a navigation instrument during an approach. A single axis hydraulic motion system was also provided. Each simulator was equipped with a projected TV Visual system. Both simulators had an associated Radio Aids Instructor console where the radio aids and air traffic communication simulation took place. Two large ‘track recorders’ were used to plot the progress of the ‘flight’ by means of a pen inking the track onto a glass panel with a Perspex chart behind. 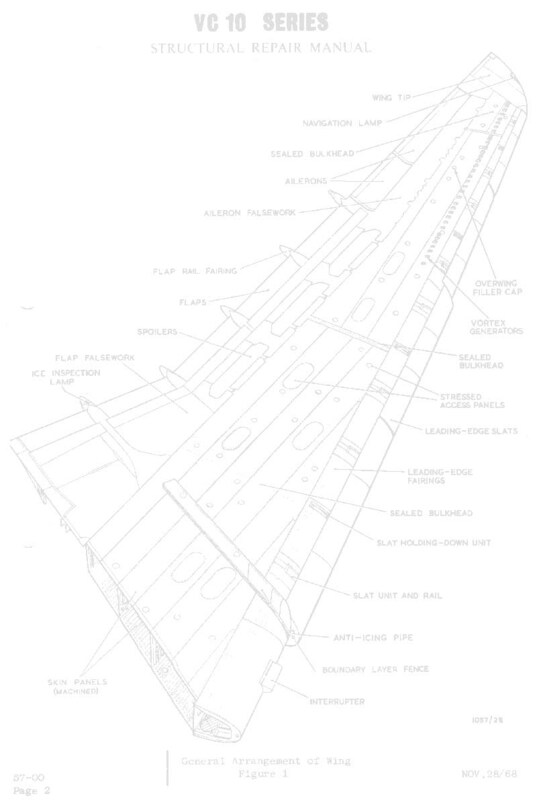 The chart was marked with the pre-prepared features, such as the radio aids and runways that were required for a particular training exercise. The coordinates of each navigational aid was laboriously set by the Radio aids Instructor before each training detail. The training details on both VC10 simulators had to be carefully coordinated by the instructors if the shared Visual system was to be used, as only one simulator could use the visual at a time. The Visual system consisted of a TV camera positioned over a scale model of an airport landscape and was approximately 20 by 80 feet in size. The camera was mounted on a motor driven gantry and electrical signals from the simulator computer determined the position of the camera relative to the model, in three axes. The camera optics were also motorised to provide for roll, pitch and yaw displacement in accordance with the flying attitude of the simulator. In order to provide good ‘depth of field’, an enormous bank of floodlights illuminated the model. To save space, the model / floodlight system was mounted vertically. Model features such as houses and trees frequently fell off and if the floodlights were left on too long there was a serious risk of a fire! The flight deck of the simulator showing the opaque side windows and the three (now covered) front windows behind which the visual system was projected. The side windows in each simulator flight deck were fitted with translucent panels that could be back-illuminated to simulate cloud flying in daylight. The three forward windows were fitted with opaque panels, which were motorised. This allowed the panels to be lifted out of view, at the appropriate time, to reveal the projected image from the visual system. How was all this simulation achieved in the days before digital computers? The answer is by a pair of analogue computers arranged side by side in a room over 50 foot long. One for each VC10. The technology employed electro-mechanical and non-digital electronic methods to replicate the mathematical equations of flight and present the results of these as appropriate indications on the simulator flight instruments. 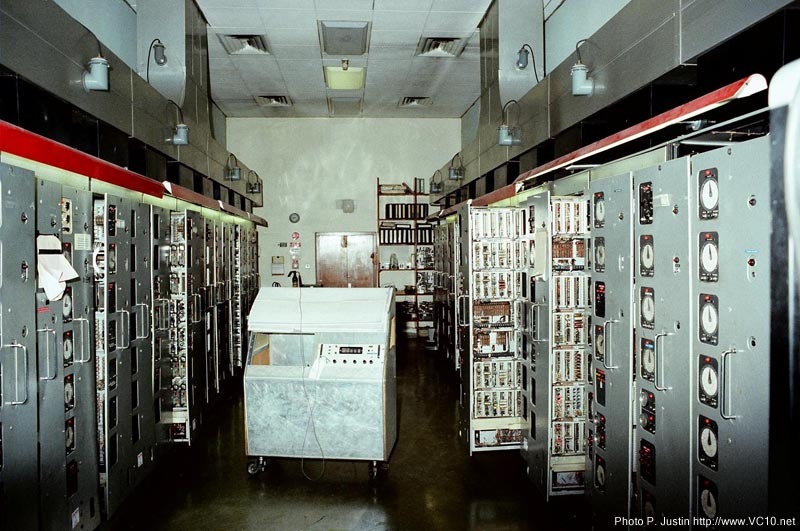 Each computer consisted of a number of racks containing servomechanisms and electronic amplifiers. The necessary amplification was provided by valves (vacuum tubes) and many hundreds were used in each computer. The vast amount of heat produced by these was extracted above each rack and ducted away out side of the building. To produce electrical signals analogous to the ‘flight’ conditions, a large number of mathematical operations had to be performed. Addition and subtraction was achieved in ‘summing amplifier’ circuits and multiplication and division was achieved by the servo-multiplier principal with the computed result or ‘answer’ being displayed on a dial on the front of the rack. More complex functions such as integration and differentiation were achieved by similar methods. A view inside the computer room which powered the two VC10 simulators. Note the airconditioning ducting at the top and the dials showing the results of various computed variables on the front of the cabinets. Flight parameters such as angle of attack, lift, drag, altitude, speed, (and many others) where computed in the first four racks, known as ‘Flight’. This used raw analogue data such as sea level temp and pressure, aircraft weight and C of G., etc. Many of the equations simulated were interdependent and formed loops. The other racks also fed signals into ‘flight’. For example, engine thrust was computed using parameters such as throttle position, engine RPM, fuel flow and other determining variables such as altitude, ram pressure, temperature, etc. The atmospheric data was obtained from the ‘flight’ racks. The overall result for each engine was passed back to ‘flight’ to determine values such as total thrust, to be used to compute parameters such as true and indicated airspeed, and so on. The remainder of the racks housed the simulation of all the other aircraft systems such as electrics, hydraulics, pneumatics, together with flying controls, flaps, slats, spoilers, TPI, undercarriage, fuel systems, etc. etc. Situated in each of the Radio Aids Instructors rooms was a further set of racks used to compute radio aids data from the pen position on the track recorders. Relative bearing and distance was calculated for each radio aid set by the Instructor. This data was combined with other data such as aircraft heading, etc, to be displayed on the appropriate system display on the flight deck, if correctly selected by the crew. Of course, all of this, and much more, is provided in a modern digital flight simulator. Today, the quality of simulation, particularly that of visual systems, is quite staggering, especially when remembering what was achieved with analogue methods in the past. 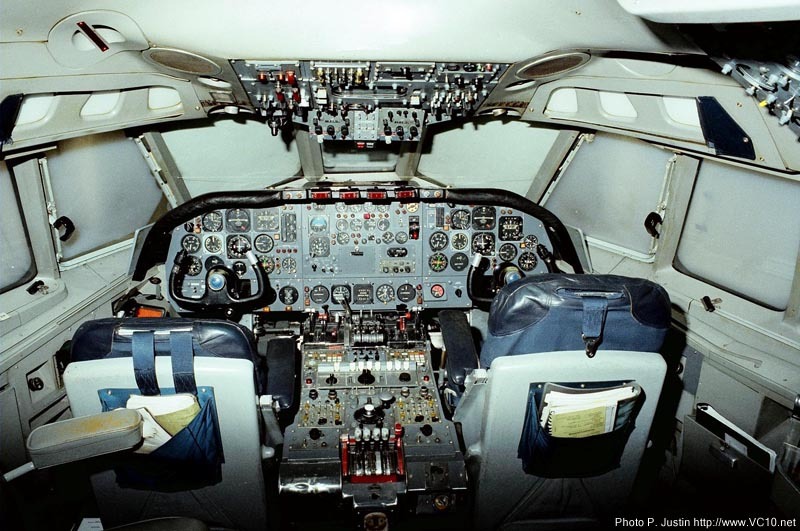 Classic analogue flight simulators like the BOAC VC10 should not be forgotten as they represent a key development in the history of both aviation and computing. 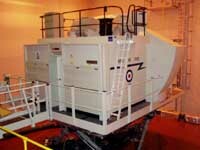 One of the two VC10 Simulators at RAF Brize Norton. As the only VC10 operator these days the RAF still needs to train VC10 crewmembers and keep them current. For this purpose they have two simulators. One started out as a VC10 C Mk.1 (type 1106) simulator and was updated throughout its career, which included replacing the original 'moving map' visual system with new computer visuals. When the tanker version was introduced in the 1980s a new simulator was produced for this version, this one is also still in use.